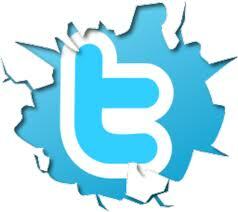 Twitter is a Blue Bird logo. The Original logo was in use from March 2006 until September 2012 Shown Below. Larry bird of the NBA's Boston Celtics Fame. On June 5, 2012 twitter unvieled it third logo redesign replacing larry the bird with an updated icon simply named as "Twitter Bird" Mountain Blue Bird. This detail had previously been confirmed when the Boston Celtics' director of interactive media asked Twitter co-founder Biz Stone about it in August 2011. On June 5, 2012, Twitter unveiled its third logo redesign, replacing Larry the Bird with an updated icon simply named as the "Twitter Bird." As of this logo revision, the word "Twitter" and the lowercase letter "t" are no longer used, with the bird becoming the soul symbol for the companys branding. According to Douglas Bowman, designer of Twitter the new logo resembles a Mountain Bluebird.